Everything Changes – The Guide to Young Adult Cancer » Scared of Every Little Ache and Pain? Scared of Every Little Ache and Pain? After going throuugh cancer treatment, you’d think that the small aches and pains of life – like having “the trots” as my grandmother would say – are no big deal. Not for me. Now, when I feel even the smallest pain, I flip out. A few weeks before one of my big scans, I had a horrible upset stomach probably from something I ate. I was on the toilet for hours in total panic mode: Sweat rained off my body onto the bathroom floor. I was shaking so badly my feet sounded like they were tap dancing. Logic left my mind and I felt like I was going through treatment all over again. I try to go on the defensive at the first sign of an ache or pain. I fight against wondering if my upset stomach is a long-term side effects surfacing or a secondary form of cancer. I get logical telling myself that if I had a new form of cancer or a recurrence, I would probably have repeated symptoms not an isolated incident. I pop a Tylenol, Advil, Pepto at the first sign of feeling sick. If I squash the symptoms of small aches and pains, it helps to I curb my fears. Prior to cancer I was little miss natural-homeopath. I never even took Tylenol for fevers or headaches. Now, I figure that after swallowing two enormous doses of radioactive iodine, my body probably considers over-the-counter drugs to be a walk in the park. Do you ever suffer from irrational fears when you feel aches and pains? Where does your mind go and how do you bring it back? 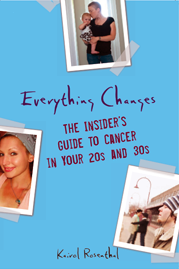 To learn more about cancer, chronic illness, and post-traumatic stress, read Everything Changes: The Insider’s Guide to Cancer in Your 20s and 30s. Hi Kairol… Sounds like you are talking about CANCERISTIS. It’s a secondary condition experienced by most cancer survivors I know, including me! I’ve attached a description of this condition. Somehow, reading this piece always calms me down, maybe makes me chuckle. I guess it’s a reality check. I also rely on the comforting words of my breast cancer sisters when canceritis rears it’s head. It helps to know I am not alone!! This is a summary of an article written by Jeff Kane, MD from the Sept./Oct. issue of Coping With Cancer magazine. Getting paranoid? It’s canceritis and it’s normal. If you’ve had cancer, you’ll have canceritis. Canceritis is fear of cancer. You get some ache or pain and right away you think it’s cancer. It comes with the territory. Somehow I don’t think the term “canceritis” is going to find it’s way into standard medical journals. It’ll need a more dignified, scientific label. So for you doctors reading this, I suggest we call it “Post-Cancer Syndrome,” or PCS. PSC is the anxiety-producing, tenacious and eminently understandable tendency among people who have had cancer to assume that every symptom represents a cancer recurrence until proven otherwise. Since PCS is a reaction both unreasonable and reasonable, the decision is up to you. Your internist can find a common enough answer for a back pain, such as over-ambitious gardening. Cancer tattoos your memory. There’s no way around that, but with time it fades. No one, regardless of their history, can be certified entirely free of cancer, they are in remission. A headache can seem like a brain tumor, but it could be tension, stress, allergies. If you live long enough, you’re pretty certain to develope another disease or two, which will give you even more to think about. Now, is that bad news or more good news? So sorry you went through a) a scan (they’re scary enough on their own; I’m a basket case for about a week each time! ); b) your bout with what sounds like a nasty food borne illness; and c) — worst of all — the kind of PTSD we survivors are prone to when anything remotely like the helicopter-sound of a *symptom* occurs. This is not a baseless hypochondria! All neurosis bets are off after cancer. The over abundance of caution we all feel, the tinge of worry & fear that it (or something like it) might be back, the reliving of our fears & feelings, being ambushed again by the residual shock from our past treatment — this is all so very normal. It’s also all but impervious to rational thought. Xanax is great. And personally I am considering desensitizing therapy with propranolol, a beta blocker that studies show helps with traumatic memories . It curbs the hyperarousal triggering the awful runaway fright. Supposedly, Propranolol helps us not to forget (that’s impossible) but to be able to separate a little from those visceral memories so we can stop reliving the after-shocks from our own private earthquakes. Ditto what Liz said about being ambushed by fears of recurrence. I’m still in treatment and find myself worrying about every little ache and shiver. Blessings of peace and Xanax as needed! And it doesn’t help that every little cold or sinus infection I get feels about 50x worse than it did before cancer. This year new to my hypochondriac list is the H1N1 stuff. I’m prone to sinus infections, and I’m pretty sure my immune system is still in recovery mode. I tend to me most irrationally worried about secondary cancers. I’ve done two large doses and one megga dose of the I-131. And I’ve made the mistake of reading all the symptoms of potential secondary cancers… I start seeing too many bruises and I go into panic mode. When my stomach is wonky, I get visions of my body scan and seeing how the I-131 accumulates in the bladder. Recurrence is a secondary worry. Any time any sort of lump pops up in my neck that I’ve never felt before, I basically need a pint of Ben and Jerry’s to mellow out. When I’m having a bad breathing day, obviously my cancer has finally decided to drift down to my lungs. I start losing hair, and I believe all hell has broken loose in my body. And sleeping… I go through periods where I just sleep too much, and my meds all seem right, I just don’t wake up. All these tend to have perfectly non cancer reasonable explanations, usually having a lot do do with outside stress or a common cold. But that’s just not where my head goes. Oh boy. I have so much junk wrapped up around other junk in relation to this that it’s just insane. I was diagnosed with rheumatoid arthritis at the same time I was diagnosed with papillary thyroid cancer. I didn’t even suspect the cancer, I hadn’t “checked my neck”, I had no family history, no reason to do that check. I went in because of the pain that just would not go away in my knees and elbows. If my primary care doctor hadn’t felt a tiny strange lump in my neck when checking other areas for pain, and hadn’t strongly suggested a biopsy, if I had sucked it up and told myself that my VERY REAL arthritis pain was simply issues from working out every other day, I would still have cancer in my neck right now, and I would still be in severe joint pain every day instead of only mild to moderate pain. Why is all of that important? If I had not listened to my own body and insisted on seeing a doctor about some aches and pains at that time, I would still be very sick right now. I had to push for the diagnosis more than someone who is older and more “prone” to these things, because at my age and in my general health, RA and cancer wasn’t supposed to happen. Automatically I was labeled as being irrational. Healthy and a hypochondriac until proven ill. How unfortunate is that? So what do I do, HOW do I figure out what is irrational now and what is real and in need of attention? My immune system is suppressed by RA drugs, my thryoid gland isn’t around anymore to help regulate the myriad of things a healthy gland is supposed to regulate. I have to face the very real concern that getting a simple chest cold could turn into something much worse, through no fault of my own and even if I take proper care of myself. I have to make judgment calls on whether or not a lingering sniffly nose means a trip to the doctor for me when most people would pop an antihistamine and not worry about it again. I not only worry about “another cancer” creeping in, I worry about my joints twisting and failing before I turn 40. As for dealing with the irrational fears that are intermixed with the real ones? I’ll get back to you on that when I’ve figured it out. I think Mandylin raises an excellent point here that is so specific to young adult cancer. Many if not most of us ya’s have had to work really hard to get a doctor to take us seriously. It can take months, (or like MaryAnn in my book – years!) to get a diagnosis. Many of us had seen or felt something wrong and it in fact turned out to be cancer. This is really different than someone who is 65 going to a routine colonoscopy or mammogram that finds cancer. Through the long, arduous process of trying to prove that something is in fact wrong with our bodies, we have almost trained ourselves to be extremely and sometimes overly suspicious. I think that time and observation can be great remedies to irrational fear. Am I shitting my brains out for a month or just for a few days? Is my cold getting better or worse after a few or more days? Ask your doctors what is a reasonable window of time to deal with a lingering symptom. Any disease/illness/condition can cause the “itus”. I think it’s normal. I was a bit of a hypochondriac before. Now I am worse. Whatever gets you though the night– be it ben and jerry’s, a glass of wine or a xanax. I constantly have episodes of “canceritis”. I try to apply logic and then the 24 hour test. For instance, if I wake up with a sore in my mouth (how my tongue cancer showed up originally), if first think back to the day before. Did I eat anything too hot for dinner? Did I have pineapple recently? Am I under a lot of stress? If my neck is swollen I try to think if I have any other cold symptoms. I then apply the 24hr test. I make note of the size of the problem area and promise to give myself 24hrs before freaking out. Most of the time, by the next morning the sore or swelling is significantly smaller. If not, I call my ENT for a checkup. If the sore is gone by the day of the checkup, I cancel. The one time I ended up going to an early checkup, I ended up getting a biopsy on my neck that confirmed a recurrence in a lympnode. So even though our “canceritis” can make us anxious, it can also be a good defense to catch a recurrence ASAP. Pretty much most of my life, whenever I felt sick or complained about anything, my mother told me I was a hypochondriac and that there were always people worse off than I. Even after the first ultrasound found the tumours in my liver, my sister said that I probably typed the letter up with the findings myself. The last 2 weeks have been aweful, Ive been to my GP 4 times, had a spinal CT, chest X-ray, breast ultrasound, pap tests and a pelvic ultrasound because I feel like something is not right. I wake up with a headache, have to force myself to eat because my digestion isn’t working properly and I’m so tired and stressed out, yet whenever I go to the Dr I feel like I’m not justified in doing so because I sometimes think, Oh It’s just canceritis! Tabstar, I’m so sorry for all that you’ve gone through in the last few weeks. Having a good doctor is so important. If you trust them and are happy with your communication, a good doc can help you figure out whether your fears merit further investigation or not. Sometimes I freak out with every ache and pain as I wrote above. But when I first started getting night sweats last year, I went to my doc and told him I knew that night sweats can be a symptom of lymphoma. (A plus and minus of writing a book about young adult cancer is I have learned what everyone’s syptoms were before they were diagnosed. A negative for the hypochondriac in me, but a plus for the educated proactive patient in me!) I wanted a chest x-ray and full blood work. He totally agreed. Thank god it came back fine. This past fall I had a continual pain for three weeks around my liver and experimented with every indigestion medication and eating habit I could think of. When I found no relief, I visited him and he suggested it was probably stress. I asked for an abdominal ultrasound anyway and he totally agreed. Again, it was nothing. In these two examples I don’t feel like I was being overeactive. I felt like I was being a smart, educated patient. I am beginning to learn the difference between the two. I’m walking a tightrope between: A.) Having been fried by a scary cancer diagnosis that’s given me all sorts of fears both rational and irrational, and B.) Being at higher risk for other forms of cancer and long term side effects that I need to watch out for. A nasty balancing act indeed. Hope your tests come back with all good news Tabstar – sounds like you have enough on your plate already. And if they don’t, we’re here for you big time. Kim’s got it – it’s very hard NOT to feel like a hypochondriac after a cancer dx. Having a cancer dx after having any other type of serious illness dx (in my case, hemorrhagic stroke) means that I’m constantly sorting out symptoms, wondering if some new feeling is a current treatment side effect or another stroke, a residual pain due to effects of intraoperative radiation or a recurrence. Those are really tough to separate out since the pain and the potential recurrence are in the same spot! Anyway, when my imagination starts running me off the road, there is one mantra that I say to myself. I heard it in a patient teaching tape that featured Dr. Leonard Saltz of Sloan-Kettering – his advice about trying to rebuild/maintain a normal life after a cancer dx was that ‘you can’t sit around listening for cancer cells to grow.’ For some reason saying that to myself – in my ‘out loud’ voice, if necessary – stops the madness. I’m mid LID diet and awaiting RAI on Feb. 11th. My TT found both lobes invloved with Papillary Carcinoma as well as the delpian lymph node. Every ache and pain in my neck makes me think the worst. Although I have a bit of a stuffy nose ….. I’m sure that the chain of swollen and sore lymph nodes in my neck are cancer. LOL And medicine is my life/career ! Blogs, websites and books like these are helping me keep my sanity ! Thanks ! This article was great! Going through intense chemo now and then home to to recoup. I find myself worrying about each and every new side effect that emerges. trying times! This is one of the best blog sites I’ve seen on this topic. I had melanoma and before I was even thru with the treatments for that I was diagnosed with papillary thyroid cancer. The Dr. said 99 percent chance that the spot that showed up on my scan was nothing to worry about. Now when Dr.s tell me “it is nothing to worry about” I cannot seem to let myself relax and believe them. I have been having belly issues now for a while and have some appts. coming up to try and resolve them and I know I am getting very stressed out and as much as I try to control my thoughts it is very hard to not think, OH NO, not again! !” I would appreciate any prayers for good results!!! Thank you….sure am glad I found this site!! Anyone who would put Pepto-Gal on her blog is a survivor for life. May you pop pepto into your 90′s. I just completed 18 months of chemo–six months of intense chemo and one year of “chemo-lite” for stage II ovarian cancer. I have had two totally clear PET scans (one just two months ago). I came through all of this treatment with flying colors–I worked every day, travelled, and generally did everything I would normally do and then some because I was finally focusing on my health and I felt better on non-chemo days that I did before the dx. Now that I am no longer under the protective shelter of monthly blood tests telling me that all of my numbers are still okay I AM FREAKING OUT AT EVERY LITTLE ACHE OR BUMP ON MY BODY. I thought that getting the treatment over would make me feel victorious–I had beaten cancer and all that. How I really feel is scared about when the next shoe will drop. I try like many of you to use logic and reason. I also wait 24 hours to see if the problem is gone. I also treat myself for aches and pains in a normal way with OTC meds. Just last week I had a bad stomachache that lasted for a couple of days. Also my BP was inexplicably high. So I called my oncologist’s nurse practitioner who is now my friend. Because she wants to be safe she wants me to go through a contrast CT scan and bloodwork. Now I AM TRULY FREAKING OUT. Part of me says what will be will be, enjoy every minute of every day because no matter what these tests show, all of this that we call life will end for each of us some day. Hearing a cancer dx changed how I approach life and now I feel like I have earned some more time because now I am finally starting to “get it.” The universal “it” was hard for me to understand before cancer. I would work really hard at my job where I made good money but I sacrificed myself. I never knew how to relax or to have fun. When my days were done I was so blasted from my work that I was lucky to be able to prepare dinner and read (for some time it was my only pleasure)before falling into bed and then doing it all over again the next day. Thanks to all of you if you read this whole rant. Because of the type of work I do I have had to keep my dx confidential–only my immediate family, my sworn to secrecy staff and my doctors know. This is the first time I have reached out to others with similar experiences. I’m glad that you left a comment here. You are not alone in keeping your diagnosis confidential. I was so lucky when writing my book Everything Changes, that I was able to interview a young adult cancer patient who kept her diagnosis confidential from everyone but her nuclear family. By the very nature of confidentiality, it if often challenging to know that it is a very valid option and plenty of cancer patients chose to live their lives this way. I’m glad you found my blog, and hopefully other resources, that can allow you to be anonymous and still get some peer support when you need it.